Halle Berry is on the cover of Essence. "The Hollywood special also includes a photo spread featuring the legendary Diahann Carroll, Oscar nominee Taraji P. Henson and The Secret Lives of Bees director Gina Prince-Bythewood. Each of the ladies will be honored at the second annual Essence Black Women in Hollywood Luncheon taking place February 19 during Oscar Week at the Beverly Hills Hotel. The March 2009 issue hits newsstands February 12." 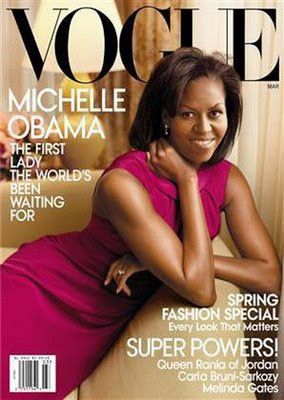 And First Lady Obama is on the cover of Vogue. Basically, it's a good month to buy magazines. Am I missing any fascinating covers?